0 Comment July 22, 2017 Like? In the post show, we answer questions from our audience all about the NewTek NDI 3.0 and features that Dr. Cross is in the process of implementing. We cover Wireless NDI, NDI Bandwidth, HDR, Mobile Devices and much more. The conversation starts with bandwidth questions regarding NDI and leads into Linux based support. We also, run our Facebook Live reaction question which was: What network switch do you own? 10/100, Gigabit or greator than 5 Gigabits? When will TriCaster users get the NDI HX update? The SDK for NDI 2.0 was released at the end of January of 2017. So as long as your software has been updated in 2017, you are running on the latest SDK and NDI HX will be able to run on your TriCaster. What is the range of the NDI Spark Connect? This is a question that comes down to the range on your wireless router (WAN) WiFi strength. Essentially if your computer can talk to it via your network than NDI will work. Dr. Cross mentions various ways to extend the range of wireless in our show. Andrew Cross: Okay, so NDI 3.0 so can you read his question it gain I want to make sure I’m answering it exactly correctly? Tess Protesto: Yeah, with NDI 3.0, how many HD signals can fit in a one gigabyte switcher? Andrew Cross: Okay, so I’m assuming here’s his saying okay I’ve got a network it’s a gigabit network. How many sources can I have running? I’ve got a computer how many sources can I receive at once? On a single so on using full NDI so the not using NDI HX you’re going it’s gonna be about the same as it was in in the previous version. So, NDI 2 and NDI 3 they both maintain about the same bandwidth our target is somewhere in the range of about 100 megabits per stream. So, let’s just be practical you can get about 7 or 8 streams on a single gigabit connection. Now, something that maybe isn’t that widely known is that NDI, just out of the box as long as you’re using the current version of the SDK not even 3.0, we’ve been using say 2, 2.0, we supported having multiple necks in a computer and we would spread the connection across two necks. So, and most computers have more than one necks so you can easily double that by having two necks just hook up two network cables and you’re gonna get twice as many streams. If you’re using that so on 3.0 which was his question we have not; we’ve kept the bitrate the same however we have because we believe that it’s about right that’s what you need to get great-looking video that’s as good as SDI and but what we have done is we have increased the compression quality at the same pit rate. So, the video will end up looking quite a bit better at NDI a version 3. Then NDI 2 and that is particularly noticeable as you move beyond 1080p. So, 4k the difference is night and day at 1080p it’s probably there if you look closely. Tess Protesto: Great thank you, I want to touch on some Facebook once to let’s see what we have here Michael Seth purchases is there and will there be NDI for linux? Did we touch on that? Andrew Cross: NDI it’s already supported on Linux we; the SDK can be downloaded for Linux, it already works our support for Intel based Linux is a lot better than our support for our based Linux but we already support Linux. Paul Richards: When you’re on Facebook we never got to ask our facebook reaction question which I really wanted to get to. Which is do you have a 10 100 gigabit or five gigabit or greater network switch at deployed, for in your office. So, if you’re watching on Facebook, if you hit the heart button, the ha, ha button or the Wow! Button. Tess Protesto: So, it goes in order hart would be 10 over 100 haha would be one gigabyte and five or more would be the Wow! Tess Protesto: So, make sure that you go ahead and answer that if you’re watching on Facebook. If you want to get to the link really quick I did put it in the description below. If you’re watching on YouTube so back to these questions. So, we got a try crap that a TriCaster question. When will TriCaster units get the NDI HX update? Andrew Cross: All so, NDI HX so I’ll give a little secret here NDI HX, we in NDI 2.1 which was released actually as in the SDK for 2.1 was released in February or end of January. We actually already built in all the hooks we needed so, that NDI HX would work when we were complete with it. So, many applications will support NDI HX today without any change. Andrew Cross: So you don’t necessary need to update as long as your software’s has been updated this year. So, I mean if your software has had a patch this year. You’re running on the latest version of the SDK that’s available today or any SDK since about the beginning of January HX will work with your device. Even if your device isn’t NDI 3. Andrew Cross: I mean it is gonna pull down to what the range on your router is I don’t I would not claim to be fully qualified to give you the absolute best answer on routers and Wi-Fi strength but if you I mean look if you can if your computer can talk to it we can talk to it. So, if you and there ways to extend there were ways to extend wireless distance really very easily including they’re not legal everywhere but you can use directional antennas. Then you’ll be able to do miles if you want but there’s that get go online look up how to extend the range of my wireless and you’re going to get you can make wireless run as far as you want these days. Paul Richards: In fact while we’re on that subject of Wi-Fi this this was actually from Nick Smith of JB&A. He asked if he was wondering about spark units you know and how many could be put on a Wi-Fi router obviously that depends on the router that you have but does it send a proxy until it’s pulled to air? Or is it just broadcasting the same amount of bandwidth all the time? Andrew Cross: Well, that is a very complicated question to answer when you’re talking about how it determines what bandwidth to use. When I think that it is probably safe to say that 10 megabits is a good ballpark but I’m so 10 megabits to me is what is needed for full 1080p, full frame rate. So, if you want to run low resolutions you can get away with quite a lot less than that now modern you know modern router wireless routers can go they think how many streams of 10 megabits can they handle. I mean that they can handle a lot, so you should be able to get quite a few streams. I would imagine that it can solve most people’s needs in most cases. It would seem to me that on a modern Wi-Fi router getting four plus cameras is pretty easy no matter what in all situations. Paul Richards: That’s it’s just so incredible with you know gigabit switch you know I feel like a hundred megabits was it was a little tough because you’re probably using it and you know people say that you should have fifty, sixty percent Headroom. You should never really be using the full gigabit switch so getting to 10 megabits. Now, we can really throw five, ten sources on there and still not have to worry you know about overloading our network because I think a lot of people want to use existing networks. And I really think they should put in dedicated networks but you know I think you’re reaching out especially when you talk about xsplit and OBS users and vmix and Wirecast and livestream users a lot of these people want. Or on very low budgets and they’re trying to put things together as much as easy as they possibly can and you know they’re just testing. Can I do this? Okay is it gonna work? Can I plug it in and I think with two or three hundred megabit streams it could possibly be more than they could handle or even on a small business level. You know is that is the IT guy gonna say yeah sure you can put 400 megabits on my gigabit router probably not but can I do 40 or 50 I think that’s possible. So, this NDI HX thing is really like the Holy Grail like you said making this possible. Andrew Cross: It is funny because we came out with NDI you know version 1 it does about a hundred megabits and it was funny because you know we had people on the high end saying to us gosh I want uncompressed I want three gigabytes you had people on the low end guy gosh I want 10 megabits and so it’s funny that even though we were square in the middle of what exactly would work for gigabit networks. You know that there’s always people who want more and there is always people who want less. But I think that you know NDI HX by having that as an available in NDI, it gives us more tools to be able to satisfy a much broader part of the IP video needs. You know which it which is what we’re trying to enable. Paul Richards: Well, it’s really, really incredible if there’s more make sure you ask all these questions it is HDR support possibly coming in the future are there? Any plans for that? Andrew Cross: I’ll just say yes I not my normal answer would be you know we’re thinking about it, we you know we don’t pronounce things but HDR is something that NDI absolutely should do. Now, I’m going pics I should give a slight explanation on this, it is my view that HDR was kind of been there were going to people who probably take it’s a slight, slightly disagree with this term but has been slightly cobbled into SDI in there that we’ve they’ve made HDR so it works on existing SDI infrastructure. Which is great it means that HDR is easily available on SDI today. But with NDI we don’t have the same kind of constraints that it needs to work on a cable that’s 40 years old and so computers can technically do HDR much, much better than that then then traditional device is good. So, for instance you know when you look at like products like outside light wave we’ve had floating-point imagery forever and my view is that when we go to HDR into one; we would bring HDR into NDI that we need to do something more than just put it basically a log gamma curve on the video signal because I think we can enable something that’s actually far more useful than that. And so, you know our intent is absolutely to go HDR and to go there really properly and not kind of make a half kind of clues. Andrew Cross: You know hey we’re just playing gamma cuff to its solution. Paul Richards: Cool! Well, that’s good to hear that was one of the questions that came out. Another one actually this is from I forget his name but he wanted to know if there will ever be adaptability? Or variable data rates that you could choose from? Or is it really kind of just device-specific if it’s a NDI HX camera? Its X and if it’s an NDI HX signal coming from a TriCaster? It’s X is there ever going to be a variable bit rate or data rate option? Andrew Cross: Yeah, so NDI HX devices can, so for instance out of the spot connect it hosts a webpage so you can get to it from a mobile device and what it basically allows you to say do you want high, medium or low bandwidth. And high which is all we’ve talked about is you know 10 megabits but you can say I want to be receiving a lower bandwidth stream for this. And we allow you to use lower bandwidth. So, and this is important because it means that you can use these in remote production as well so that you can take the signal across the public Internet. And so, obviously the quality doesn’t look as good but it you it’s a trade-off isn’t it. So, for people who have constrained bandwidth you can say I’m and I’m gonna run low bandwidth. Which basically brings it down to about maybe 3 to 5 megabits and so we actually with HX we do have some degree of variability already built in. But we’re not looking I mean our goal is to be an API or I should say a standard that works. We want you to look at that video singing well it looks great and not need to think okay look I’ve manually tweaked this value here and this value there because that’s not solving it for people. We want it to just work so we do you know when we talk about it; we talk about the 10 megabit. Which is the maximum although you know on something like spot connect you could you can actually tell it to go lower. Paul Richards: Very interesting yeah because I think that’s something that people were asking about a couple you have some are the harder questions here. You know a lot of people were waiting for the bird dog, they were you know I noted if we could address the difference between. Is there any difference between the bird dog and the spark? As far as I’m not sure if the bird dogs even chipping so, maybe you can’t even speak to this question but it was a question that had been continually coming up? People were waiting for this bird dog unit that really never had; came it may be coming to market it may be maybe it’s not. Can you say anything about is there a difference in the way that spark was implemented? That made it easier for you to get it to market? Andrew Cross: So, first of all bird dog I’m great friends with those guys, I speak to them I mean all the time and it’s certainly going to come to market and it’s real I’ve seen it working. So, I don’t you know I don’t want anybody speculating that it’s somehow vaporware it’s absolutely not and I’m sure it’s going to be an absolutely awesome product. I think they’ve done a great job I’ve been I’ve they’ve taken our hard job because we worked with them right. I mean they were probably when we released NDI 1. They started working on this and they have they have taken on developing all of this themselves and I might hat is off to them for doing that. I, they’ve done an amazing job and it’s going to be I’m sure it’s going to be a great product. You know a spot connect and bird dog are different devices and they have different strengths and I would encourage you to look at the differences between them. I think we you know we have a HX support which one set lower bandwidth but at the same time I’m bird dog might run slightly low latency. So, you know that that’s the trade-off we support wireless. Their different products I see them solving different needs and you know I mean we are happy to work everybody and we try to be you know work with everybody and birds dog are included. And I they going to make great product. Andrew: I look at that up and I go gosh if I’d had NDI HX when we’ve made that app. It would have been so much it’s our absolute our goal and I; you know right now I’m working on getting everything shipping, getting the multicast I mean we’re trying to get this out to. 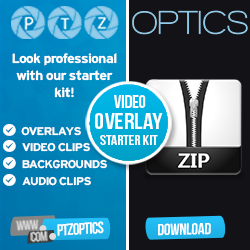 We’ve got to you know I mean you have to think that right now we’re coming out new taking effect coming out with 10 products because we’re working with these from PTZ optics to Panasonic. Our own products we’ve got the SDK they I mean gosh we’re we want to get every piece of this done. We believe in this more than anybody and unfortunately that I have to sleep a few hours, a few night. Andrew Cross: Are you so I hope I’ve given you the best answer is absolutely our intention to. We absolutely want to and I wanted as much as everybody else but I you know the real world somehow gets in the way sometimes. Tess Protesto: Well, that’s totally understandable this one keeps coming up. How do you control unauthorized people from taking control over a PTZ camera during a live stream and broadcast. Andrew Cross: Okay, so the first answer to that is don’t set up your network so that can happen. At the end of the day security is about network access if some you know the every other T person will know that the true security to your network is stopping somebody walking in the door and plugging into your network because the moment you have access to that network. You have access to any devices on it and any holes in that network are there to access and so we would strongly encourage people to. To make sure that they keep their networks segmented to where they want people to control and where they don’t and there are wonderful tools for doing that. This is a problem that companies far bigger than us of have solved and make great tools available for and we would encourage you to go that way. You can put passwords on these things there’s flute manager in NDI. All of these things work but at the end of the day they you know we’re not a security company and those that do this are far better than any one of us will and will offer things that serve your needs better, better, better than we were quite honestly. And so, we want you to work with the best technologies available and when it comes security there’s great stuff out there. Tess Protesto: When it comes to the sparks is there a maximum number that someone can use? Andrew Cross: No! We have a whole load of them on our network right now. I’m sure that there is and put it this way when we started working on NDI we actually we designed all our UIs around this idea that you know we were used to making eight input switches and so hey you know eight 10 maybe 16 inputs would be available on the network. So, we started work on this then what happened is we had all our developers starting to put all their sources on the network and suddenly before we knew it we had hundreds available on our network and so we had to actually go back and redesign all out own user interfaces to support hundreds of devices. Because and so I’m sure that there’s some practical limit but it’s gonna be high. Tess Protesto: Right, Jan says does NDI does talkback and monitoring? Some of these I’m not, so if I sound silly cause I’m not sure. Andrew Cross: It’s a great question so first of all NDI itself is is a protocol that connects a sender to a receiver and that can be from a camera to a switching system or it could be you know from the switching system back to the camera and NDI itself technically so yes it can be used for talkback today. If people take advantage of doing that, I guess the may be slightly more practical question. Is our new take going to standardized that controls around how it could be used for talkback because it so NDI itself the technically support top back. So, the question is you know the practical question is do we want to standardize there and we might well and a lot of these things come down to the level of interest we hear from the market because we fight hard and anybody who keep asks us for changes NDI. We fight hard for usability in the API and a usability to developers because at the end the day this is going to get adopted if it’s easy to use. And so, we will add talkback if that is if you know beyond the fact that it could do it iNDIrectly today. If that is something that’s heavily look look forward them it’s not hard to add. Especially for audio because audio takes no bandwidth. Paul Richards: Well, I’ve actually a pretty much asked all the questions we went out on Facebook to the relative attractiveness if Tricaster user groups and I when to different places and I asked what do you really wanted to hear. And you really answering everything here, one of the ones we did specifically ask you do we real expected latency for NDI HX? And I think we threw around a 30 millisecond number, roughly. Andrew Cross: It’s probably closer to 50 but it’s about here’s the thing it’s about a frame worst regular NDI. So, that’s the trade-off you get much better compression for about a frame you know so about 30 milliseconds worth late worst latency. There was some small number of applications where that really matters but the vast majority I mean it’s not what people are used to and I know you’ve used this you can speak to it does need to be seen to be believed because a lot of people are used to IP. Where you kind of wave your hand then you look over the monitor and you see okay I’m going to wave my hand now and it’s nothing good but it’s not like that at all. It is really very low latency it is it I mean for all practical cases there’s no latency as far as I’m concerned. Paul Richards: I couldn’t believe it and I can’t wait to get it out to our customers. We didn’t mention the fact that one of the amazing things with anyone with a Gen 2 PTZ optics camera. It’s a simple firmware update so you’re gonna be able to try it yourself and see what it’s like. Which I’m really excited about that we did there was one actually question I have here is the 3.0 SDK which I guess is gonna be released soon is that preferred over the the version 2 SDK? And are there any differences the backwards compatible for the developers out there? Andrew Cross: It is a hundred percent pact was compatible I have worked really, really, really hard on this in fact I can download an application that was written with a version 1 SDK I can I mean I can change out the DLL no recompiling can just change the DLL on the drive it’ll run with the Version 3 SDK. That’s how hard we have tried to make it back was compatible. It is preferred it works better and you know we work with more users every day that goes by so we hear of this bug, that bug, this thing we can improve and we do it all. So, version three you know it’s got lots of improvements, it’s got performs improvements, it supports multicast but is completely backwards compatible and I should say it’s also forwards compatible. And what I mean by that is we have designed any version of NDI. So, that a version one converted to version three center. So, version one is force is compatible with version three in the same way that version three is backwards compatible with version one. So, you know we don’t want there to ever be interoperability problems between any two NDI devices that have ever been sold anywhere. And that’s so in we would come, likewise we consider it a bug if something didn’t work there it’s a bargain with and we would fix it. Paul Richards: Yeah! Really excited to see the use cases outside the live so now we’ve gone over an hour so I know you probably have to go through one of the things that’s my personal question for you is. If I can maybe end on this or if there’s something burning in the chat room test throw it in here but my personal question is. I’m interested to see how this seems perfect for the live streaming and broadcast industry and I have to imagine that was your first and goal but I wonder and think of the adoptions and videoconferencing or anything even personal. I’m not sure where this could go but one of the things that I’ve seen you do and what makes me confident in NDI you know because there are other protocols and there are other ways to transfer IP video. But you really, I feel like you’re trying to make it easy and for the sales people who have to train, for the people that have to go out and evangelize this idea, for the people, for your partners, you know that is what I personally that’s what I care about. The most is it frickin easy and is it gonna work what every time and from what you’ve told me you know that seems to be one of your goals. We want it to work on every switch we want them to be easy and that to me is the most important thing like all the little but all the other stuff that we’ve talked about. Like everyone’s excited about it they all are know the answers to it but if it’s gonna be easy that’s what’s gonna make it scalable and I know this is not even hardly a question but live streaming broadcast perfect. It’s like it’s the nail on the head is probably going to be the next standard. I really do believe that from everything I’ve seen and been in the industry and going to nab but there any other markets that you think like is there people in video conferencing. Is it is it possible unified communications, other applications, distance learning lecture capture. Paul Richards: And education like can you give us a little picture of that because I feel like live-streaming and broadcast is very clear but the other you know what we see back. Andrew Cross: When we first came out with NDI we expected it weeks I expected it to be adopted by our competitors and I was that was good that was what we wanted we never believed that the interconnect nobody should make me interconnect part of proprietary anything. So, that we were fine with that we were good with that and I thought this all would happen and I gauge success by if that happened and it happened relatively quickly. But what blew my mind and I did not expect and I would love to say that man oh this great foresight and you know we knew this was going to happen. Was that it got adopted in all sorts of other areas that I have never thought about and that is maybe the coolest part of all this. I’ve been sent people doing huge; like huge on stage shows. Where they have massive 4k LED boards that cover the whole back of the stage and they have got NDI integrated so that things from the dancers on the stage or integrated back in with the lighting effects and I mean who would ever think doing that. I’ve seen things where people are projecting onto the side of buildings using NDI. I’ve seen nightclubs where people are using it to do projection and I mean in the audio world. It’s I mean I’d never thought of those markets and people using it you know game streaming. Streaming computer games is huge you know xsplit came along and said to us well we integrated NDI and I o server exploit I don’t know that I heard of them before and so I got talking to them and you know I’m not a big gamer by the way so I got talking to them and I started talking them and they like yeah we got millions user. So, what say that again listen oh yeah we’re up nearly 10 million users; 10 million users OBS has NDI I mean these are markets that are just staggeringly huge that are changing. I mean think about this live streaming’s big you know whip doing a live show now. That was unheard of but twitch multi-billion dollar company, Google have just got into online game streaming, Microsoft has got into online game streaming, you have got three billion plus companies that just got into game streaming in the last two years that is how quick that market is growing. Then education I mean that’s moving IP everywhere I mean at the growth of these markets is unbelievable. You know corporate I mean corporate is going to be huge in with video that. Andrew Cross: There’s every company has a marketing budget and the world is moving away from printed physical things that you hold into moving things that is what you know the young generation. The viewers out there are watching and so they’ve got to be producing more videos. So, you need easy ways to do this and you can’t be doing it on 10 gigabit networks you need to be doing every office building is wired for gigabit. That’s why we target gigabit so I think there was just massive growth around this I think we you know there’s gonna be more video produced in the next year than last year and more than year after that and it’s going to grow quickly and I mean it’s an exciting time to see this stuff happening and coming together. And I just hope that we’re a tiny little part of that and I do believe I’ve gotta say I think that 10 years from now I think everybody acknowledges video will be done over IP. Everybody acknowledges that I mean it would be crazy over IP. How can you argue the opposite I mean it is the cameras are digital devices we’ve gotten that well it’s why these two things not already talking to each other. So, I you know what I hope is that we will get a look back at kind of when NDI HX and NDI came together as one of the things that actually put kind of a spark to the Gunpowder and actually made that revolution become real. Because right now we’ve got NDI which on the desktop and on the application side of things is huge and then you’ve got all these IP cameras out there that are on there on huge and really NDI HX and NDI 3. Are bringing those two things together which is probably what was needed to make the IP revolution; the true video IP revolution take off. So, I hope that that this is at least one of the one of the kind of announcements one of the things that helped make that happen and if I did that my life is you know I’ve achieved one of my bucket list. Paul Richards: Well, I think that NDI HX is a serious probably the biggest thing I’ve heard of in the NDI world. I think that’s the biggest announcement I’m so happy that you’ve brought that to market because that’s where things I think you’re going to start to see get real. If that’s the best way to put it that’s when things are really going to get real that’s when you can say can I get 10 megabits to on the on the gigabit network Mr. IT person they can’t say no to you for that. Maybe a hundred no I could make it maybe they could be a little upset but thank you so much for coming on the show there was so much that answered here I think everyone is was really excited sorry for the rocky start. Thank you for sticking with us. Tess Protesto: That’s certainly true and for those of you who didn’t get your questions answered. Go ahead and bring them to the user group and post them in the Facebook user group that we have facebook.com/groups/ptzopticspals. It should also be in the description and we will try to cover them throughout the next week thank you.